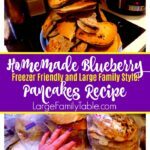 Homemade Blueberry Pancakes Recipe | Freezer Friendly and Large Family Style! Mix all dry ingredients and make a well in the center. Combine wet ingredients and pour into the well you created. Stir all together until wet but not overmixed. Spoon onto hot griddle or skillet and brown on both sides. Let cool completely and store in gallon-sized freezer bags. To eat, place bag in frig the night before. Heat in microwave or toaster oven. I have done these pancakes many ways, with the blueberries still frozen, with them fresh, and with them thawed. You do whatever works for you and what’s easiest.